This route was what got me to the auto shop twice, then to two different schools and back home, all on a bike today. It was a little long for an aluminum fixie, but what the heck, it was fun. The car got me to and from the auto shop. The bike, everywhere else. So last week, the van, our only car, lost it's clutch, or more succinctly, the pilot bearing that helps the clutch engage shattered. A local shop fixed it but then the van came back with the inability to shift into 1st gear and a very troubling habit of not turning over immediately when the key is turned to "start". I had somewhat of a handle on this kind of thing and sent it back, knowing that both problems were related to the mechanic having taken the transmission out and putting it back in. It was expensive but these little trifles were fixed free of charge. Well, well, well.... Bikes aren't that reliable either. 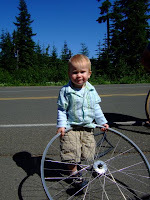 For instance, on the cargo bike ride mentioned below, our tandem pulled a flat tire, and then when we pulled the wheel off, the hub fell apart. It's one of those ingenious Phil Wood style hubs but cheaper, much cheaper, and I'm not impressed. On our progressive dinner ride, the lights stopped working on my beach cruiser which I had lent to a friend for the ride. There are a million places where the problem could be: light bulb, grounding issue, switch, wiring that was put together by me and run through the gas tank horn, etc. What was it? The magnet in the hub was glued in (Sturmey Archer dynamo hub with a drum brake) and when the brakes were activated, the heat caused the glue to fail, causing the magnet to spin with the coil, thus not creating electricity. How about that? Aaron's bike repair, the only place to go for help with hub generators and internal gears, fixed it with aplomb. I didn't even pump up any tires. Today's ride featured a disarmingly cushy ride on some 25 mm rubber. But the list goes on: In the past month, I've had 9 flats, a failed tire, a hub fall into pieces, a hub work loose, lights go out on two bikes (the aforementioned magnet, and a connector break apart), 1 lost orange flag, numerous shift adjustments, an inline cyclocross brake interrupter came apart at the hinge, electrical tape holding the bar tape magically moistened and fell off, one broken fender (overuse, two for the year), mudflap came loose, numerous zipties, became brittle and failed, replaced one set of brake pads, one sticky drum brake (tandem), lighting connectors have come loose, reflectors have fallen off, broken brake cable, and now two menacingly squeaky pedals. Are bikes really more reliable? Why can't Toyota or Porsche build a bicycle? We like to eat. We like to ride our bikes. This is a ride where we get to celebrate both activities. 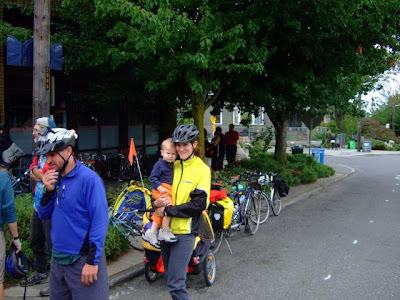 Granted, we spent much more time eating than riding our bikes, but that's not the same as a bad thing. Here we are at Kerry Park in Seattle. Theoretically, doctor Frasier Krane lives somewhere behind this photo because of his very nice view that gets featured out his window. Just like Austin City Limits, there is no way that you can get the proper parallax to have all of the buildings featured in Frasier. It's a product of photoshop. This one is a product of a very nice girl who we recruited to take the picture of us. Here we have Claire and I riding along with Thorvald in the trailer. 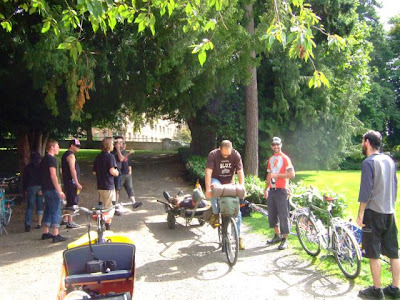 Many people are in tow as we make our clockwise navigation around the top of Queen Anne Hill. Leisurely would be an understatement for the pace of this ride. I would put it as "glacial". We like to stop every few blocks and even then we seem to get separated. It was fun getting all the pictures. Love it. The next section features very nice members of our group. Thorvald is trying to get away before the ride begins. We are back behind Kristina's house here and Thorvald is finding the limits of running down a closed alleyway. Our route started at the top of Queen Anne, which some of us rode to. We then rode out to Wallingford for the main course, finishing with dessert at our house after dark. No injuries were reported and the only mechanical was that my Sturme Archer Hub Generator fell apart when the magnet came off and the lights stopped working. Are bikes really cheaper than cars? Discuss. I had to get out to Bellevue for my weekly teach-in over there and advertised it since some people were talking about doing the farm tour on Saturday. Soon, Robin, the lead instigator of the farm tour, hopped onto my plan and decided to use me as a pacer out to Bellevue, perhaps to points unknown. Kristina signed on the very minute we were about to leave and held us up for a while. I was very concerned that I wouldn't make it for the class, but what do you know, those gals are super, super fast. I just got behind and churned away, pulling the cello and teaching get-up and trying desperately to keep up. Across I-90, we passed people, over Mercer, we passed some more. I couldn't really keep up on the hills, but they kept talking whenever I would fall back and pretty soon, or whenever they pulled off, I would catch up. I got there in record time. I just got paced in, Lance style, with the best team in the Puget. It was awesome! Ladies, you saved my bacon. Thanks so much! 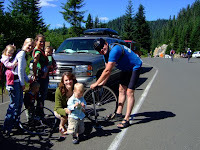 Here is a nice article in the Oregonian about randonneurring and all of its joys and sorrows. And here is a write-up from a friend's ride on the Mountain 600 a few weeks ago. I kind of wish I had taken 26 up to Windy Ridge just for the craziness. Don't be confused, Mark is a monster bike rider and has been president of RUSA for a couple of years. Ouch! It's said that the most expensive question you can ask yourself is "how much does my bike weigh?" but I promise to stop right here and now. For comparison, take that same bike from the picture at the top, take off the handlebar bag, change the tires from 32's to 35's, add a big Carradice bag filled with shoes and a camera, take off a water bottle, and there you have it. Enjoy. Trees, trees, and more trees. That was the promise when Steve signed me up to ride with him on the Cascade Bicycle Club High Pass Challenge September 7th. Steve has some pretty natural gifts on the bicycle, not the least of which is that he weighs about 70lbs less than I do so despite his relative newness in the sport, he can pretty much smoke me on the hills. 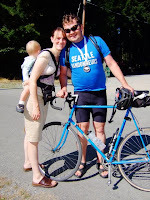 He also enlisted Greg, who is also new to biking but comes from the ultra marathon world so he's no slouch either. We rented a cabin in Packwood for the weekend with our fantastically beautiful, brilliant, and charming wives and kids (4 kids total, three wives, come on!) and played around Friday night, most of Saturday, which you saw in the post below, and then rode this little ride. We a got up early, well, I got up at 6 since the ride didn't start until 7 and fumbled around with some Raisin Bran and other sundries. Steve and Greg were already primed and pumped as witnessed here. I didn't know we were supposed to ma tch. That's Greg left, Steve right. Soon, we were on our way and within half a mile we had arrived at the start. There was a lot of commotion and it feels very different from a Randonneur ride, but it was really fun and I think designed to get you pumped up for the "huge" trek. The music was blasting and they had a P.A. warning people about various aspects of the ride, like some kind of war briefing. Still the nervous commotion was palpable and it was really cool. Erin showed up unexpectedly and took our picture, which I'm sure is forthcoming. Everyone was in assorted performance gear and seemed to have the latest and greatest bicycles and gadgets. Notice the sweet not-hydration pack that Steve is sporting. I was wearing wool for the day and so the dudes thought they might bring some extra clothing for the day too. As it turned out, this pack had a streamlining effect on ole Steve and, well, we'll find out later how that turned up. Steve in foreground. Here we have my ride for the day. It's an '85 Trek 460 64 or 65 cm frame. Yes, those are 700c/28 tires so you have the scale to work with. I was looking for a bike that would look like the racers from the 50's with friction downtubes and barely enough seatpost for comfort. I found it on Craigslist for $50 and have only lubed the chain, put on new tires, seat, and pedals. It runs great. The gearing is 52/42 with a 13/24 in the back so I was a little worried about tackling the hills, but after the ride the day before, I figured "why not?" And don't worry, this is a totally supported ride. I never needed more than one water bottle. This is the opening pace line where I got to ride amongst the carbon fiber. Sure the bikes are nice, but look at all the carbon fiber around and along the side of the road. That carbon fiber is green and lush and makes the air smell so very nice. The dudes with me were cool too. At one point, I was leading the group and a short rider passed and took the lead. Perhaps he wasn't happy with my pace, but after a while, I notice that I still wasn't getting any wind blockage. I remarked "hey, I need somebody taller to coast behind" , to which the rider behind me yelled "That would be you!" This is Greg racing down the hill. I made it to within 4 miles of the turn around point, had lunch, and then took off on my way, only to find about 2 miles from the end, Greg tearing it up down this hill. I had my camera ready so that I could get pictures of my buddies and I'm glad this worked. Although holding a peach in one hand and a camera in the other had it's difficulties, I'm glad I got the snap. The strange part is that Steve was nowhere to be seen. I asked Greg why I hadn't seen Steve yet and He yelled out with glee that Steve was back behind a little way. I think this was with glee because Steve set himself up as the uber rider before the ride and was constantly casting disparaging remarks on Greg's bike, which except for a garden variety front derailer issue, performed flawlessly. It goes without saying that Greg was riding flawlessly too. Just before the last hill to the turnaround, I came upon Steve. He was in good form too and I was glad to get a photo. He's riding second from the left. Windy ridge is a bicycling paradise ever since the road was closed to auto traffic. It feels a little like the planet of the apes as you ride by amenities that were designed for modern convenience such as interpretive centers and parking lots. Buildings appear here and there that are no longer in use but the greenery is building back after the Mt St. Helens explosion. I was last up here in 2000, come to think of it and so much more is growing now than before that I almost didn't recognize it. I wonder if it will go to gravel in the future or if some, newer government might decide to allow access again and fix the place up. At the end of the road, you reach a large parking lot and there is a gravel road leading to a better view of the mountain. None of us went that direction because it might rough up our tires but I did get this nice picture of Spirit Lake and got to show off my completely dependable and charmingly retro bike. I spent a fair amount of time in the my lowest, 42/24 gear ratio (46 gear inches if any of you are wondering) and was happy to get to the turn around point at 10:30 or about 3.5 hours after starting. Without getting all Rivendell for a second, I have to say that I really dig this frame and I think the stem is way cool. Here's another shot of this fun little bike with Mt. St. Helens in the background behind a closer mountain. I've never been to the Johnson Observatory so I don't know how things look from the NW, but if you go around this hill, it's pretty nice. I on the other hand, was feeling like I would like to catch my compadres. I took off back up and then down the hill, through Windy Ridge and was whooping and hollering when presently, I was beset by a tire blowout. No problem says I, just whip everything out and go to work. Once I got the new tube pumped up, the bead separated out and the blew my second tube out. This was the tube Greg had agreed to let me take as a donor tube in case I found somebody stranded. Greg, I owe you one, extra light weight tube. I'll get it to you when you hand over my trailer flags! Hostage transactions are what they are. I had now a third tube and put this one on, but first booted the tire with two dollar bills protecting the tube and also the rim from this Schwablean mess. The dollars stuck out so I only pumped the tire up to about 40 lbs and let the dollars rub against my brakes. This would be a slow, slow ride back. I limped up to the Bear something parking lot and much to my surprise, my favorite pit crew, and arguably three of the most beautiful women in the world were waiting for me there. Claire, Sumer, and Erin came up to cheer us all on, and looked a little worried when I finally came in as heretofore, I was just a few, perhaps 10 minutes behind the others. Now I was more like an hour. 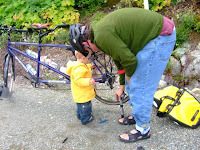 Thorvald quickly set to work fixing my flat and working on my wheel. I swapped out a tire from my Cross Check (I'm very glad that I decided to go with narrower tires for this weekend on this bike as I would otherwise have been stuck), threw it on the blue bike, Thor helping all the way. This made for 5 tire/tube changes. Here we see the extent of my pit crew: three lovely ladies and four brilliant children. Some other biker took this shot, no doubt because he was jealous. Just try to tell me that you aren't too. Pictured are from left to right, Linnea, Sumer, Pierson, Erin, Leo, Claire, Thorvald, and Brad. 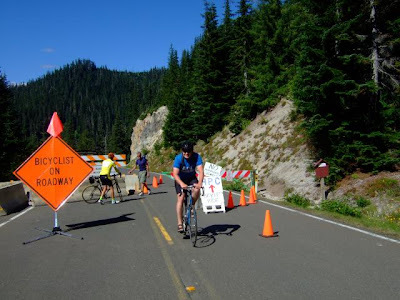 Before too long, I was off and running down the road, past a motorcycle accident (they were like locusts this weekend), down the hill, passed some cars, passed many cyclists, passed a few of the food stations (I only availed myself of two the whole trip), and rode onto the finish. After a confusion about the route, wherein I stupidly tried to get riders to go the wrong way, I sort of bonked out and had to ride my own pace for a while. It wasn't all bad though because the river road from Randle to Packwood is just delightful. Just enough chip seal to appreciate my steel frame and fat tires, just enough rollers to make you push without always gearing down, just enough turns to keep you from thinking it too long, and just flat enough to recover your legs. It was sometimes a single lane and always provided nice views of plenty of carbon fiber, water, rocks, and sky. Once I made it in to the finish, and healthily silver at that, Steve came up and bid me good arrival. I regaled the masses with tales of ruined tires, punctured tubes that were strapped to the body as insurance, beautiful angels who came to my rescue and gave me a new, if mismatching tire, and saluted my trusty steed which saw me through good times and better times. Here is the happy family at the finish. I got my silver medal for finishing between 7 and 9 hours, and Claire was very happy to see me. 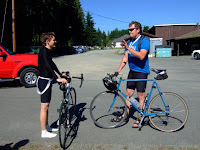 Thorvald chided me for being so slapdash with my tires and tubes, and after a short rest, we were off in our cars. The tire fiasco cost me the time between gold and where I finished, but I wasn't expecting to finish gold until midway through the ride. In fact, I finished sooner than I thought I would even with hour spent with the tires so on the whole, it was a very successful day. I have a few comments about this ride that I would like to share. First of all, driving 240 miles so you can ride 114, or in my case 185 considering the two days, feels like a bit of a waste. It was super pretty, but the nature of the ride was predicated on dependence. 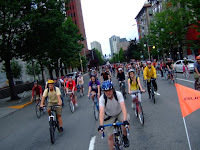 Dependence on the automobile, dependence on food stations every 10-20 miles so that we might complete the ride, and dependence on weather so that we can ride bikes and wear clothing that don't handle adverse weather at all. I've been up a few passes in my day and this was definitely the most posh. It was a perfect day weatherwise, ridden with perfect friends, and we stayed in a perfect cabin with a hot tub that I should say, we made excellent use of. It was super fun to ride fast and light in contrast to my usual practice, as I'm used to carrying my own gear, sometimes even watermelons, but at least enough to get me through most anything, and it was fun to ride with so many people, and see so much carbon fiber. Despite the aforementioned concerns, I had a fantastic ride and a wonderful, wonderful weekend. How about that? Thorvald in the end was assuaged that he was able to have the medal. I'll have to bring him along next time. I got the trucker hat as a memento, and we got home somewhere around 7 after nice burgers with Erin, Greg, and Leo. From left to Right: Claire, Thorvald, Brad, Leo, Erin, and Greg all hiking in the Grove of the Patriarchs. But I'm getting ahead of myself. 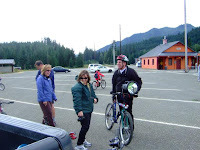 We were up in Packwood this weekend from Friday until late Sunday because Steve had signed me up to do the Cascade Bicycle Club High Pass Challenge. I was pretty into it and had never biked in that neighborhood before so it sounded like a deal. 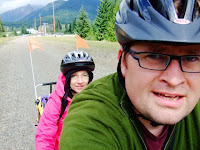 The ride was on Sunday but we had all kinds of spare time and spare bike capacity on Saturday so once it was decided that we would hike up at the Grove of the Patriarchs, I hooked up the trailer, threw Thorvald in, and set off up from Packwood. It was 7 miles on Hwy 12 and the morning chill was around so I closed him up and pretty soon he was asleep. You turn onto Hwy 123 north and it's just beautiful. After 3 miles, you reach the gate of impending doom. Welcome to Rainier National park. Abandon all hope, Ye cyclists who venture here. At mile 6 on 123, or just about 13 miles, I stopped at the entrance gate to the park and admired the hand hewn elements, the mission statement of the gate either holding in or holding back. I loved it. I love my son. Perhaps someday, he will appreciate this as much as I do right now. The tree was merely named "big spruce" or something like that. Walking back across the the suspension bridge. I think that this is Dino Rossi's plan for rebuilding 520 on such a small budget. After a nice lunch with friends and some time wearing out boopschon, I headed out on my way, wanting to make the most of the $5 I spent to get into the park on my bike and thinking that I could get back across Paradise and back to Packwood in about 3 hours. This was the first stop of Box Canyon. I've driven by it a number of times and couldn't really figure out what the commotion was all about. Its really nice. It a river cut out of stone, seemingly precise, very loud, and just plain cool. I also like this photo because I go on these rides all over and people think that they could never do something like this. I say, even the dude with the belly can do it. You can too. I'm not sure how this photo..... no, wait, a group of very nice Korean students took this photo of me. It's the downward side to the west of Paradise just south of the Nisqually River. This valley is remarkable and you could see for miles. Behind the camera however, Rainier was creating its own weather with a touch of snow. At Longmire, you take a back road south of town and haul over this bridge to take the non motorized shortcut to Skate Creek Road. This looks really new and I had heard that the washouts were severe two Novembers ago. It's nice to see some rebuilding in the style of the previous gate. Skate Creek Road is a lovely downhill into Packwood that just made my giggle. It seems to be the perfect bicycle road. I recommend it to anyone looking for a nice, but challenging bike ride up over a pass. On another note, I can't officially condone this but since bicycles are so easily lifted over a gate, it stands to reason that one COULD go into Mt. Rainier National Park as easily as I left it. You would have to contact me to find out how this is done, but seeing as bicycles pay the same rate as those infernal motorcycles, it could be supported that those arriving under their own power could arguably be absolved from paying the entrance fee. This is the Cyclops. The Cyclops can see everything in the dark. Randonneurs of the world can rest eas, knowing that they too can have the best, most brilliant lighting system in the known world. This light was strapped on with bungee cords and zip ties to the to of the owner's handlebars. All I can say is that I am suffering from some serious "lighting envy". Here is the entrance and wait, I should back up a little and help with some background. 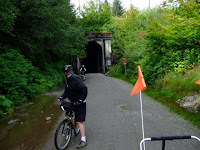 I went up with Thorvald on 30 August to help with the LDS singles campout bike ride through the tunnel at Hayak on the Iron Horse Trail State Park. We had about 30 adherents and the ride went off without a hitch. Here is some of the group coming out of the tunnel on the second time through. Why a tunnel, you ask? Because it's almost 3 miles long and this may be the only time some of these wonderful people ride their bikes during the year, so I'm here to help. After the tunnel part of the ride, some of the more hearty members of the group decided to ride the 25 miles back to Ensign Ranch, where the campout was taking place. 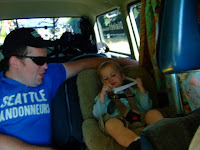 Two middle aged guys on mountain bikes, Kristina (pictured soon), Thorvald in the trailer, and I decided to take off. No, Thorvald has not suddenly grown 2 feet in height, this is Glenda, who decided to take advantage of my having brought the tandem to climb on and have spin. She totally rocked the house and provided great conversation as well as being a great engine. Paselas and Iron Horse do NOT mix. The last time I rode with Panaracer Paselas (Tour Guard models) on this trail on my single, I got three flats. This time it was two but we somehow made it in. Thorvald is pictured here helping out and making sure that my tools don't get lost. A few posts down on a ride with Kent, I rode on Maraton XR's and had nary a problem. However in a few posts from now, you will see that Schwalbe tires have their own problems as well. Thorvald is such a good helper! Kristina exhibits what I consider perfect form on a bicycle. 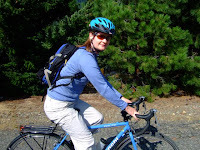 She rides, is completely comfortable on a bike, and knows her limits. Dang, that girl is cool. She bailed me out on the third tire pump up and got the pump really hot from the friction. Dang, that girl is cool! With riding partners such as these, I have no problems with life.